Nilorn is renowned for offering and supplying a wide range of bespoke products of which you can see a selection of below. With our team of in house designers we are able to quickly and efficiently work with you to deliver products that are to brief and on budget. Not only do we have UK designers but we also have on-site UK production with a team of variable data and rotary print experts whose knowledge and experience is second to none. We are asked everyday to design, source and produce products that are not part of our standard product list. If you have an idea for products, packaging or trims that you feel do not fit into any of the sections above please contact us. 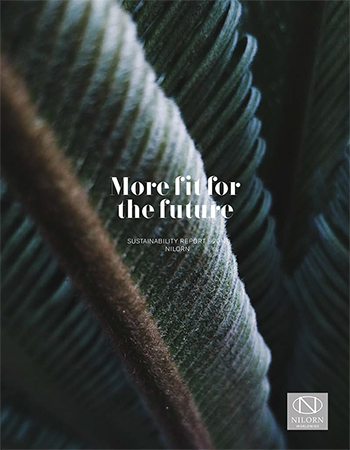 More fit for the future is Nilörngruppen’s sustainability report, where we report on our work, our progress and the way forward. The bottom line of our approach is that resources, both natural and human, must be used in a sustainable way. Take a look at the digital version below.